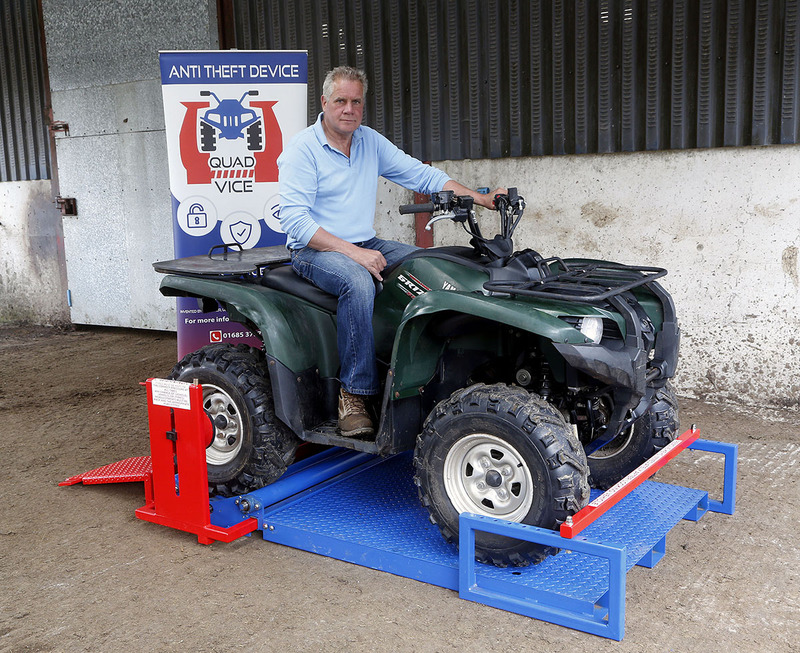 With the ability to safely secure a quad bike in 10 seconds, we check out Welsh hill farmer Gareth Davies’ anti-theft invention, the Quad Vice. Barry Alston reports. Gareth Davies with his Quad Vice creation. 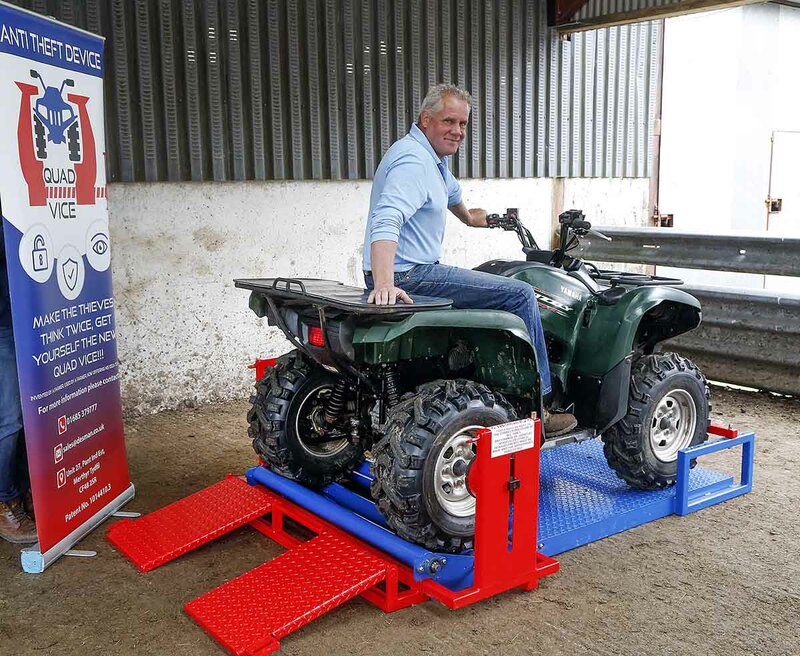 As quads (ATVs) continue to be the most targeted choice for many thieves, with about 380 stolen per year according to police figurers, a Welsh hill farmer has come up with a patented security device to make thieves think twice. Called Quad Vice, the stand alone immobiliser employs a novel clamping system which takes just over 10 seconds to engage, preventing any make or model being ridden or wheeled away, says its creator. Gareth Davies, of Wernlas Farm, Penderyn, on the edge of the Brecon Beacons National Park, developed the idea after experimenting with a number of prototypes with the final version now being manufactured and marketed locally. 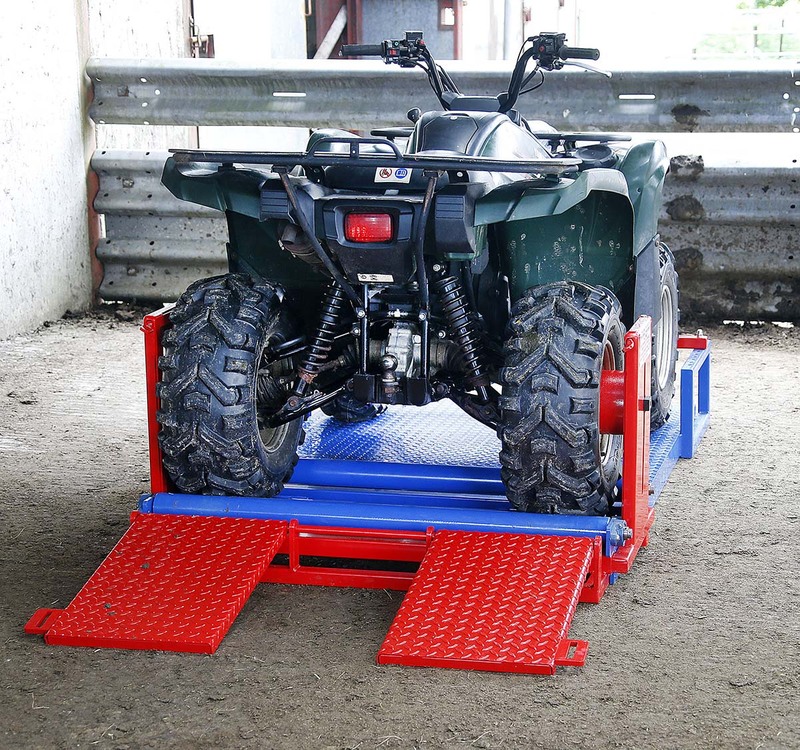 The device consists of a heavy steel platform onto which an ATV can be driven. 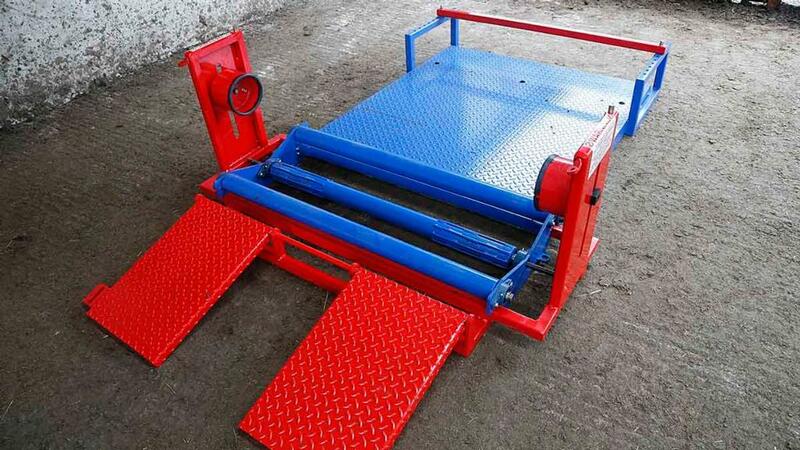 Via rolling road-type rollers, the back wheel of the quad can then be used to drive the rollers, which in turn screw wheel clamps in or out of position. The quad’s rear wheels drive rollers which screw the wheel clamps in and out. Fully adaptable for any width of bike and wheel size, the clamps grip the wheels and lock them in place, being further secured by two key operated bolts which slot into the platform base. In their raised position the platform’s ramps are also lockable. Variable quad lengths are also catered for by a moveable bar at the front of the device, fitted with tamper proof bolts – though any forward movement is prevented by the grip of the wheel clamps, with the only exit being backwards. Exit is only possible by unlocking the four locks and using the quads’ rear wheels to power out the clamps. The device is based around a steel platform. One of the first customers of the Quad Vice is South Wales Valleys sheep farmer, Dilwyn John, who has lost no fewer than five quads in recent years. None have gone missing since he bought one of only half a dozen of the devices which have so far been manufactured with a price tag of £1,500 plus VAT, though this could be reduced if produced in quantity, says the manufacturer. “Personally I regard the outlay as value for money considering that although the insurance will pay out on the insured amount, that does not cover what is usually a £100 excess charge and then there is the cost balance of purchasing a new replacement bike. That could be several thousand pounds, not to mention the inconvenience of being without one,” says Mr John. “The build quality is such that I see it as a lifetime investment that will hopefully put an end to my quad thefts. Away from his workshop and the third generation to farm the 47ha (116 acres) upland holding, Mr Davies keeps 250 outdoor lambing South Wales Mountain type ewes alongside pedigree Welsh Black and rare Whitebred Shorthorn cattle. While keeping some of both breeds pure, a Whitebred Shorthorn bull is also being used on the Blacks to produce Blue Grey calves of the type more commonly found in the North of England. Heifer calves are finding a ready market locally, with the steers obtaining Morrisons premium prices.